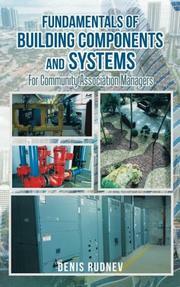 A debut guide aimed at community managers focuses on property maintenance. According to Rudnev, residential communities, and the technology within them, are becoming increasingly complex. As a result, there’s a demand for an exhaustive synopsis of the basic elements of physical property maintenance that’s not just useful for current community managers, but will also aid “those who are aspiring to enter the industry.” Apparently, there’s a particular demand for an introductory treatment of HVAC systems and elevators that’s not bogged down in overly technical jargon, something the author provides. The book is split into 10 chapters, each one devoted to an area of responsibility for a manager: domestic plumbing, fire sprinklers, trash chutes, and landscape maintenance are among the items covered. Rudnev furnishes both illustrative photographs and graphs, tools that are particularly helpful when the subject, like “Building Electrical Supply,” is a technologically difficult one. For the most part, the author doesn’t presuppose his readers have any knowledge of the topic; in the chapter on electrical supply, for example, he provides a definition of switches. Rudnev’s primary intent is not to deliver a how-to instructional manual—the reader will learn the basic components of a traction elevator but not how to repair it (though he does give detailed instructions on how to use an elevator key). In this brief but comprehensive volume, Rudnev’s prose is unfailingly lucid—there isn’t a single line in the entire work that demands effortful interpretation. He has a teacher’s facility for patiently parsing the complex into its constituent parts—even the completely untutored novice should understand the more challenging sections, like the one describing the typical electrical system. Of course, the fundamental nature of the work likely won’t be very attractive to seasoned veterans like the author. But the book could be a valuable guide to those tasked with hiring community managers—there’s a lengthy discussion of the typical landscape maintenance contract, for example, that covers the basic responsibilities of anyone in charge. An accessible and impressive manual on building systems, useful for beginners or those charged with teaching them.